EpiPen Alternatives And Other Generics Caught In FDA Backlog : Shots - Health News Four years after user fees were imposed to speed up the review of generic drug applications by the Food and Drug Administration, more than 4,000 generics remain in limbo. Where are the generic alternatives to EpiPen and other expensive drugs that have lost patent protection? 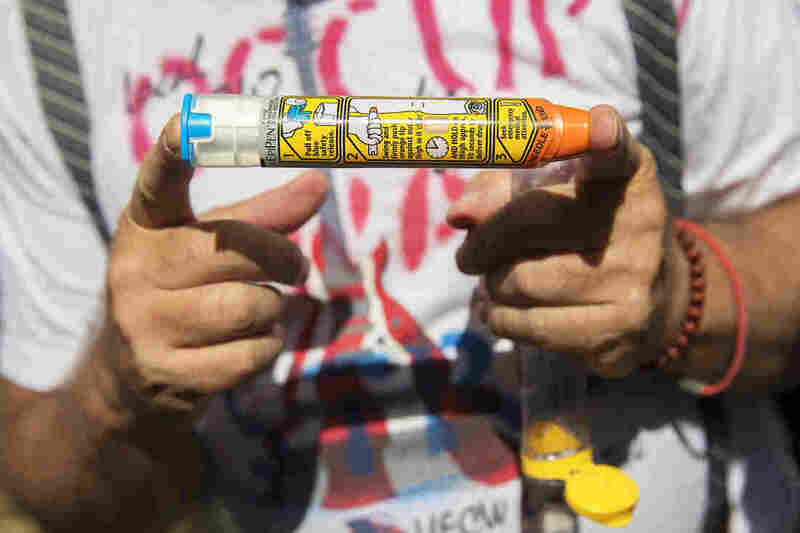 Consumers and lawmakers pushing for cheaper alternatives to the EpiPen, an antidote for life-threatening allergic reactions, and other high-priced drugs are seeking answers about a stubborn backlog of generic drug applications at the Food and Drug Administration. Even after the agency started levying user fees on drugmakers in 2012 to pay for more people to review the medicines, the backlog of decisions still stretches almost four years. As of July 1, the FDA had 4,036 generic drug applications awaiting approval, and the median time it takes for the FDA to approve a generic is now 47 months, according to the Generic Pharmaceutical Association, a trade group. The FDA has approved more generics in the past few years, but a flood of applications has added to the problem. By comparison, the European Medicines Agency, Europe's version of the FDA, has just 24 generics, including biologically based biosimilars awaiting approval. The FDA's generic count doesn't include biosimilars, which are more complicated medicines to review. The EMA along with the European Commission, which handles approval of marketing materials, are approving generics and brand-name drugs in about a year on average, according to the EMA. Critics say getting generic alternatives to the U.S. market for products like EpiPen is still taking far too long. Other off-patent drugs with rising prices and no generic competition have also drawn scrutiny, including Turing Pharmaceuticals' Daraprim, for toxoplasmosis, and Valeant's cardiovascular drugs Isuprel and Nitropress. "We are concerned that Mylan (maker of the EpiPen) has not faced much competition for its product," five U.S. senators wrote Aug. 24 to FDA Commissioner Dr. Robert Califf, adding that one of EpiPen's nongeneric competitors, Auvi-Q, was recalled in October, granting Mylan a near monopoly. "News reports indicate that generic versions of the EpiPen have been subject to additional questioning by the FDA and have yet to be approved." On Monday, three members of the House Committee on Energy and Commerce wrote a similar letter to the FDA, seeking information about the EpiPen generic applications it has received and how they've been prioritized. When asked whether the FDA bears any responsibility for the lack of EpiPen competition, FDA spokesman Kristofer Baumgartner said he couldn't comment on pending applications or confirm their existence, citing confidentiality rules. But he stressed that the FDA pushes pending applications for drugs with no current generics to the front of the line and approved 580 generics in 2015, a record for the agency and 40 percent more than in 2014. "The FDA is confident that the overall trend in actions on generic drug applications will be one of continuing improvement," Baumgartner said. In March, generics giant Teva Pharmaceuticals told investors that its generic version of EpiPen was rejected by the FDA, and that it wouldn't be able to launch the generic until at least 2017. Adamis Pharmaceuticals reported a similar rejection from the FDA for its EpiPen generic in June. Mylan has said it will offer a $300 generic in the coming weeks. Because Mylan also makes the brand-name product, it won't have to wait in line behind other pending generics. Dr. James Baker, the CEO and chief medical officer of the advocacy group Food Allergy and Research Education, said Mylan's move may deter other generic manufacturers from seeking approval. Adrenaclick is the only other epinephrine auto-injector on the market, but it isn't an exact generic of EpiPen and can't be swapped automatically at the pharmacy if a doctor has written a prescription for EpiPen. Adrenaclick also isn't widely available. "You call up 100 pharmacies, and maybe 10 have the device, from what we gather," Baker said of Adrenaclick. He said several factors have allowed EpiPen's price tag to swell over the years. Many patients were in the dark about EpiPen price increases until insurers started shifting more of the cost onto consumers a few years ago, and getting approval for a generic that's both a drug and a device is more complicated than getting approval for a drug alone, he said. Meanwhile, Mylan has aggressively marketed its product and raised doubts about alternatives. And documents show that Mylan submitted a citizen petition to the FDA arguing that people trained to use EpiPens wouldn't be able to use Teva's pending generic epinephrine auto-injector because of design differences. "Is Mylan doing anything illegal? No," Baker said. "It's taking advantage of all these things to take the market and basically push it to an extreme." The FDA's generic backlog isn't a new problem. In 2012, it was so large that it prompted the government to start charging user fees to generic manufacturers to provide the funds for the FDA to speed the process. The fees built on the 20-year-old Prescription Drug User Fee Act, which required brand-name drugmakers to pay fees to expand FDA's capacity to review applications for those medicines. In the first three years, the FDA collected $1 billion from generic drug manufacturers. The fees were used to hire an additional 1,000 employees, and put the Office of Generic Drugs on par with the Office of New Drugs by reorganizing it and moving it from four outlying buildings to the FDA's main campus in Silver Spring, Md. The funds were also used to upgrade the office's information technology. The FDA says on its website: "Additional resources will enable the Agency to reduce a current backlog of pending applications, cut the average time required to review generic drug applications for safety, and increase risk-based inspections." In October 2012, there was a backlog of 2,868 generic drugs awaiting approval, and the FDA said it would take a "first action" on 90 percent of these drugs by 2017. This summer, the agency met its goal a year early, but a first action isn't an approval. Instead, it stops the review clock and puts the applications back in industry's court. Only 1,551 generics have been approved since the fees on drugmakers were initiated, and that total includes some extra applications that weren't considered part of the official backlog. So, all told, the agency has only approved about half of the backlogged generics that were awaiting approval in 2012. "Most applications from the backlog will need to come back to FDA for additional review due to deficiencies in the submissions, before approval is possible," the agency said in a statement in responses to questions. David Gaugh, senior vice president for science and regulatory affairs at the Generic Pharmaceuticals Association, said standards used to compile generic applications when they were submitted three or four years ago have changed while the applications were sitting in the backlog. So when the FDA got back to those companies, it said the applications were of "poor quality." The applications for generic drugs have continued to pile up even as the FDA approved a record number of generics in 2015 and again in the first seven months of 2016. The number of generic drug applications tripled from 2002 to 2012, according to January congressional testimony from Janet Woodcock, who directs the FDA's Center for Drug Evaluation and Research. Still, some see signs the agency is on the right track. "I think that it is an optimistic picture overall ... at the FDA, there's been a lot of progress, and I think there is more to be made," said Dr. Aaron Kesselheim, an interdisciplinary drug researcher at Harvard Medical School and Brigham and Women's Hospital. "This is not something that people should think has been solved at this point. It's totally an ongoing process." Kaiser Health News is an editorially independent news service that is part of the nonpartisan Henry J. Kaiser Family Foundation. Follow Sydney Lupkin on Twitter: @slupkin.